WuXinji Phone Repair V1.6.9 is a small application for windows computer which allows you to repair various Smartphone and Tablets in the World. It allows you to see the Diagram of Mainboard, SCH Giagram, BLK Diagrams. It also allows you to test the basic settings on your Android or Apple iOS Smartphone or Tablet. It also allows you to test the GND Resist, MTC Schedule, Check out the Repair Videos, Printing and Smart QA solutions. It comes in two versions i.e Limited Edition with limited resource and Deluxe Edition (paid) with all the unlocked features. 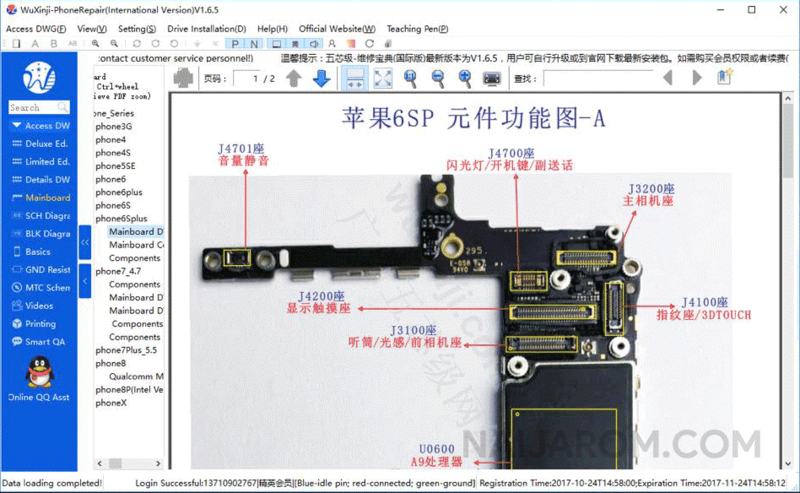 It also allows you to see the Circuit diagram of Apple iPhone, iPad, Samsung, Huawei, Oppo, Xiaomi Smartphone and tablets. [*] Credits: WuXinji Phone Repair V1.6.9 is created and distributed by WU Xin Ji (developer). So, full credits goes to WU Xin Ji (developer) for sharing the tool for free.